Trying to lose baby fats? Finding healthy exercise guides for your kids? Maybe you have even tried one of those "crazy revolutionary exercise" or "secret fat-burning diets"? There are tonnes of articles, books, programs out there that overpromise you results that sound too good to be true. And guess what? Most of them are! My education and experiences have taught me better than to focus on those easy-secret-breakthrough solutions, so I sought to solve my own problem instead. My solution has NO fluffs and is in fact NOT easy! BUT just like being a mother, it is hardwork and extremely rewarding. Hi, my name is Jessica Hardy and I am a fully qualified yoga instructor, personal trainer, nutrition advisor, and most importantly, a mother. I have over 10 years’ experience running yoga and fitness classes for people of all ages, including kids, pregnant women and moms like you! As a mother of a beautiful daughter, I was in that exact same position as you now. I was shocked at just how much my body changed during the pregnancy and after giving birth. Even as a fitness instructor and yoga practitioner, there were undeniable changes. I struggled with finding the time and energy to get fit after my pregnancy. Raising my kid is a full-time job (that I love)! Motivation and willpower can only get you so far. I needed an infrastructure for success! I was clearly over-stressing my body and mind, all the while thinking it was better for my health! It was a very inefficient way to get fit and was in fact unhealthy! I was constantly tired and got cranky easily. Even at work I caught myself making clumsy mistakes and soon I stopped exercising altogether. On one hand I want to continue being a caring mother that is involved in raising their kids properly. On the other, I need to get fit and lose the extra baby weight! I knew this was a false dilemma; there is a solution to this and I was determined to find it. So I took a month break to reset my mind to focus on studying and testing. Fortunately, I documented my efforts and the result of many trials and errors with my daughter was compiled into a manual! It took many research, rewrites, and funding to develop this refined solution... But I am proud of my new baby! What this means is that you will get to bond with your kid WHILE getting fit! This was the solution I was looking for. Think of the benefits. both you and your kid will be getting fit. both you and your kid will spend quality bonding time together. you are setting a good example for your kid to lead an active and healthy lifestyle. more active fun for you and your kid. I was not sure at that time if it would be useful for anyone, but the feedback have been fantastic! Honestly, the exact moment I knew I must share this was when my daughter surprised me by being very pro-active about "play time" together. Moms know; getting kids to do what you want is a miracle. My daughter was a stubborn kid but after trying a few techniques, she clearly started to like the exercises more. Of course to her she was simply having fun while I was getting fit fast! The whole experience I went through with my kid is definitely something that both of us will remember fondly for years to come. Now, this manual is more than just a simple introduction to exercise and diets. honest - everything in the manual have been thoroughly researched and personally tested by me and my daughter. non-complicated - can workout at home and no gym/other equipments needed. full of actionable insights - direct & easy-to-follow instructions telling you exactly how and what to do. Additionally, the benefit you get from this manual will be 2X because of your kid! That is twice the benefit with a bonus workout partner. BUT I want to strictly note that only getting this manual will not guarantee you and your kid a fitter life. That is only step one! You will need to read, digest, and execute! Do not worry though, this manual was created to inspire, and guide you on the most efficient methods to get fit. Pay attention to that because that is the most important point here. Efficiency is key in our case. We want to spend the most optimal time with our kids and to get fit. I created this focusing on 20% of the stuff that brings you 80% of the results. All things being equal, the more dedicated person practicing the most efficient routines will generally be fitter. To be clear, this isn't magic. It is a process! Many call this a shortcut, while others see it as a steep and rocky path. The key and most important factor is to be dedicated and start. Success in getting fit and healthy, therefore, requires sufficient understanding of your body, what each exercise is good for, what foods to eat, and when to involve your kids. By following a specific system I learned the best path to get fit and being a better mom to my daughter. All this is contained in the manual. This program will challenge you, have you enjoying the right kinds of food, make you and your kids laugh, as well as getting you looking, and feeling, fit, toned and terrific. Go through this manual and you will be fitter and happier than you have been in your entire life! I guarantee it. Again, dedication and motivation matters. Enjoying a healthy lifestyle should be the focus. And THAT benefit will last a lifetime. Here is my challenge and guarantee for you. I have purposely discounted the price of the item to be below any gym membership, weight loss plans, fat burning pills, or even a good meal for two at a restaurant! I am confident that if you practice and let me guide you in my no nonsense manual, you will absolutely lose weight and be fitter with your kids. If you dedicate yourself and follow the manual but for any reason do not see any results, contact me to get a 100% money back refund. No questions asked. That is my simple challenge. I know what works and that is why I am so willing to offer this money back guarantee for a full 60 days! 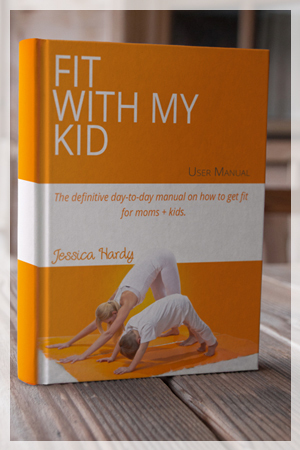 This manual is for moms who want to learn how to drop pounds efficiently, master your body, and have a good time with your kid while doing it! Written in simple-to-digest language with exact actionable instructions every day so even beginners know what to do. 65 pages of professional guidance. Printable PDF format or EPUB format (for iPad, iPhone, Android, Mac, PC, Kindle). Only manual designed for you and your kid. No gym or heavy equipments required. Increase your energy level and muscle tone. Easy planning with duration estimates for each workout and activity. Receive unlimited updates to the manual forever. Fast response for any questions, assistance, or support. and get all the bonuses below free! Simple organized workout sheets for every workout to track you or your kid's performance. Special column to star your kids performance. GET THE ENTIRE Fit with my Kid solution today! 60 Day Lose Weight or 100% Money Back Guarantee. Q: Can you ship the manual to Australia? A: For cost-savings purposes, the manual and bonuses are only sold in digital format (PDF/EPUB). This is actually better, since there is no shipping cost, plus you can download the product immediately to use (any country), and you can reference it on multiple mobile/ebook devices. Q: Who is this manual suitable for? A: While the majority of the focus is on mothers with kids it is suitable for people of any age, ethnicity, and body types. Whether you have never exercised before or simply looking to upgrade your fitness to the next level, Fit with my Kid will guide you in getting fit in the most efficient way. A: No. While the manual is a living manual (meaning it will be constantly updated or improved over time), it is only a one-time purchase to you. All future versions will be available to download at no additional cost to existing customers. Q: Why should I listen to you instead of _____? A: Because I have studied most of the techniques and advices of other "experts". Unfortunately, some advice is too generic, difficult to implement, and even downright unapplicable. While I think some experts have good fitness advise, I have tested it and as a mother with a daughter, I have taken the best from each of them and combined them into a solution that works best for moms like us. Q: How would I ask for a refund? Is it a full refund? A: Yes! 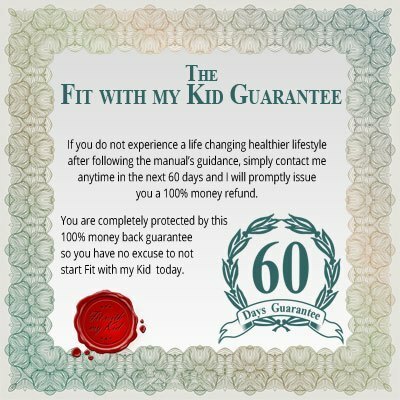 As part of the 100% money back guarantee, I will refund the full amount paid if you decide that the manual is not suitable for you or your kid within 60 days. Refund instructions can be found here. Q: I really like the product but it is too expensive for me now. Is there something I can do? A: We understand every mom wants to get fit but may not be able afford this price point. That is actually why the prouct prices are heavily discounted from time to time. The value of the products actually exceeds $300 and was originally planned for sale at $97. From experience, giving it out free has the negative effect of it not being used at all. However, we are determined to prove Fit with my Kid improves people's lifestyle especially for future generations. So please reach out to me personally and I will see what can be done. Please send your comments, testimonials, stories, or questions to me personally at, jessica@fitwithmykid.com anytime! I read all emails and try to respond immediately. I look forward to hearing from you! [Flickr] Good Exercise, Good Mind courtesy of Korean Resource Center. Youtube - American Greetings and Cardstore. World's Toughest Job.